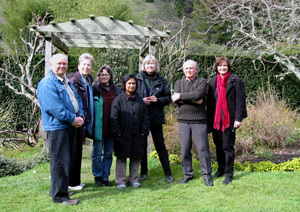 Recently several of us spent some time together at Green Gulch Farm near Sausalito in California. On this page I will display photos of that trip so that others might get a sense of what we got ourselves into. All of these initial photos were taken by Dawn. I know there were more pictures taken and I hope to add to the array later. 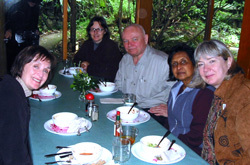 The intent of this trip was to briefly immerse ourselves in a meditation centred community, and thereby deepen our personal meditation practice. 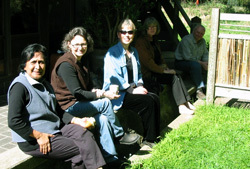 On this trip we all followed the regular monastic schedule of meditation and work in the mornings and were free to do other things in the afternoons. On this morning all of us had been assigned to work in the garden area, providing an opportunity to photograph all of us together. This part of the garden is an area framed by a square yew-hedge with arboured entrances at the cardinal points. We are standing in front of the north entrance. Later in the season the entrance will support rose plants that climb from both sides. 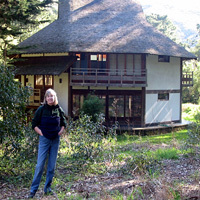 This is the guest house where Joan and the rest of us stayed. This building was designed and built by zen students from Green Gulch. It is largely hand crafted and is held together with joinery rather than nails or other conventional fasteners. It has held up remarkably well for about 25 years. 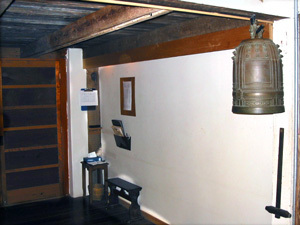 Here is the entrance to the meditation hall (zendo). It shows the densho bell along with more mundane items such as lists and seating charts. 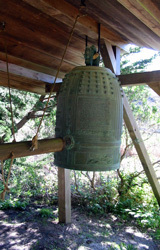 This beautiful Japanese temple bell forms part of the soundscape which marks the early morning at Green Gulch. 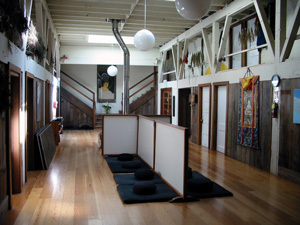 This is part of the zendo building called Cloud Hall. This is where very late comers to meditation would sit and also where people waited who had scheduled an interview with one of the teachers in the community. The doors lead to rooms which now house zen students but which originally formed the stalls for the prize bulls which were this building's original residents. 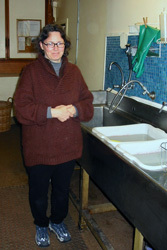 The kitchen was one of the prime work locations. On the left Dawn is standing with a Green Gulch resident and on the right she is preparing to chop. 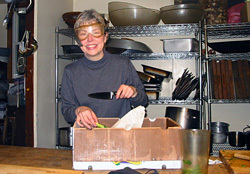 Paulette, I think, was washing pots when the centre shot was taken. 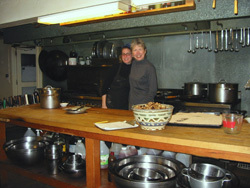 Srima and Elaine also worked a lot in the kitchen but so far I have no good shots. Here we have a little bit of detail from in and around the zendo. The seated figure is Manjusri, the Zen exemplar of discriminating wisdom. 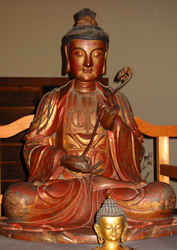 The smaller figure which can be seen at the bottom of the image is a seated Buddha. 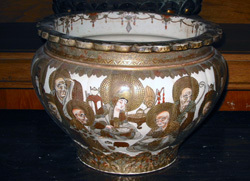 The lovely bowl is Chinese porcelain with all the Zen patriarchs portrayed around. This bowl is full of sifted wood ash (from the many wood burning stoves) which will hold sticks of temple incense. To the right is the O-Bonsho, the large temple bell which has it's own housing close to the zendo. This temple bell produces a very deep, resonant sound which paces the early morning meditation. 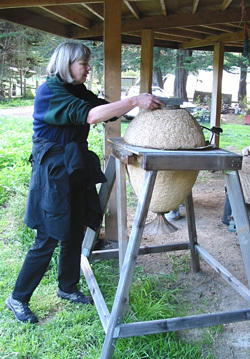 Joan here is examining an unusually shaped beehive. The honey which this hive produces comes from the flowers in the garden and is especially sweet, dark and flavourful. In the afternoons there was plenty to do. Hiking was popular. 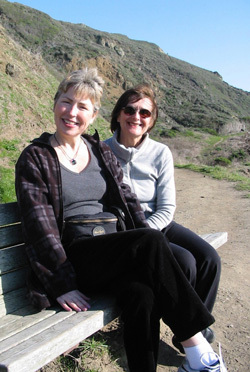 Elaine and Dawn are resting on a bench not too far from Muir Beach. 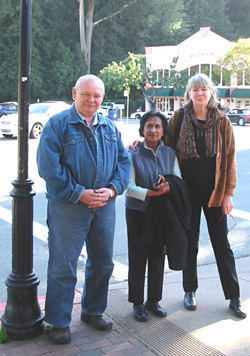 Wayne and Srima and Joan are waiting for a bus after an afternoon of consumer therapy in Mill Valley. 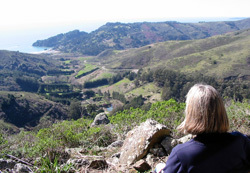 Below, Joan is looking down the valley toward Muir Beach from Hope Cottage, to which she and Dawn had climbed. Hope Cottage is the highest point. We were wonderfully well fed. On our final day we are catching a few last rays waiting for the taxi to come and begin the journey back to Victoria.